I hadn’t been to Philadelphia since I was eight years old, but I still remembered visiting Independence Hall and the Liberty Bell with my third grade classmates. So when I got the chance to return to Philly again a couple of months ago, spending time in the historic district was at the top of my list. Taking to heart the advice to be in line when the ticket booth to Independence Hall opened, I was part of the first morning tour of the site where the United States of America was born. In those hallowed halls, in the sweltering summer of 1776, fifty-six courageous men gathered to defy a king. Eleven years later, representatives from twelve states gathered there to create one unified nation with the adoption of the U.S. Constitution. If that won’t bring a lump to your throat, I don’t know what will. Next stop was the Liberty Bell. When I visited back in 1963, anybody who wanted to could just walk right up and touch the bell. Not anymore. Now it’s inside a building with soaring glass walls that allow a 360-degree view of the bell from outside on the grounds. To get into the building, you have to line up and go through airport-like security. And you’re not allowed to touch the bell. But you can read the famous inscription: Proclaim Liberty throughout all the land unto all the inhabitants thereof. As the story goes, on July 8, 1776, the Liberty Bell rang out to summon the citizens of Philadelphia to the first public reading of the Declaration of Independence. Most historians doubt that such a thing actually happened because the steeple in which the bell hung was in such bad shape. But it makes for another great lump-in-the-throat experience, especially when you’re gazing at our nation’s most iconic symbol of liberty and emancipation. Just a stone’s throw away is the Betsy Ross House. I couldn’t wait to see the residence where the famous seamstress operated her upholstering business. Legend has it that General George Washington and two other men visited this house in 1776. 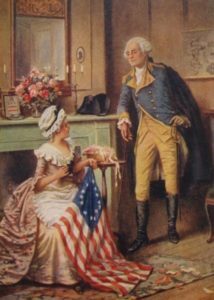 Washington showed Betsy a sketch of a flag with 13 red-and-white stripes and thirteen six-pointed stars. She told them she could sew such a flag but suggested changing the stars to five-pointed ones. The men agreed and Betsy quickly went to work creating the very first American flag. On June 14, 1777—Flag Day–Congress adopted the Stars and Stripes as our official national flag. My tour of Betsy Ross’s house wasn’t the peaceful and contemplative experience I’d hoped for. I was accompanied by three busloads of wildly enthusiastic elementary school students who crowded the narrow stairways and blocked my view of the tiny rooms. But I’m not complaining. I only hope their visit to the birthplace of the USA will someday bring a lump to their throat, just like it did to mine.